Search Engine Optimization (SEO) to increase website traffic, acquire more leads and increase sales. Brand recognition, as everyone trusts the search engine results. When you are on the first page of Google.ca for Toronto and GTA, for your prospects, you are an authority in your industry. The increase in organic site traffic generally resulting in more leads that call you. Lower cost compared to pay-per-click (PPC), even though organically optimized pages still need to be constantly monitored. Toronto and GTA businesses are taking advantage of organic search engine optimization. When search engines such as Google and Bing visit the web pages, their search algorithms look at the website domain name, page titles, the overall website and page structure, including page headings, text and other page elements, such as images. ​While search engine algorithms frequently change to achieve the highest degree of relevancy, specific criteria remain consistent, with minor modifications. For example, most popular search engines assign an authority score to your site. They look at who is linking back to you, and at how many clicks your website gets, to determine the value of your content to Internet users. How do you optimize your website for search? According to many search engine’s guidelines and general SEO industry, you don’t need to optimize your website and web pages. They are trying to convince you that if you have unique and quality content, you will rank high in the search results without an effort. Search Engine Optimization indeed is a separate discipline that can be hard to understand for most business and difficult to implement and manage using internal resources. Considering that most businesses compete with other companies offline and online, generating genuinely unique content in your particular niche is not an easy task, considering that most business owners are not professional copywriters. Without understanding what you are up against, you will be leaving money on the table for your competitors. In fact, many small business owners "reuse" website content often provided by vendors and business partners confusing search engines. Needless to say that in any event, your webmaster should follow basic rules when designing your website. The main issue is that despite popular belief, it’s not easy to find a good, skilled webmaster or web developer. Your SEO company employs the resources necessary to make your website content easy to read and comprehensible to the search engines, thus achieving search engine optimization objectives. 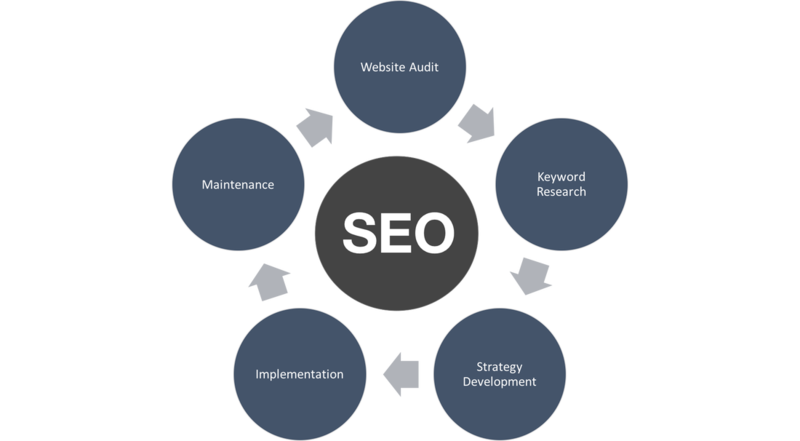 The optimization work is performed by specialists that undergo rigorous SEO training. Is your website well optimized? Find out right now. Get an instant, free website SEO Audit Report. While the flow of free traffic sustainability still requires hard work, if executed correctly, you achieve nearly permanent results. ​We have been in the search engine optimization business for over 2 decades - that’s a lot of know-how. Since no one knows everything, we have developed and nurture partnerships with the top SEO experts worldwide, as well as best selling authors on the subject, and copywriters to ensure your business’ online journey is a great success. ​Already have a website? We will make sure that most of the existing resources are reused as much as possible, saving you valuable time and money. Website content is KING with professional SEO copywriting. Even the best SEO methodology will fail without high-quality content. As a business owner, you need to concentrate on growing your business. Because of that, we will take care of all aspects of your website maintenance and web content creation and optimization, including the delivery of high-quality content for your website. It includes regular blog postings and articles written by professional copywriters. Ready to take advantage of SEO and get more leads and sales? ​How long will it take to optimize a website? ​​If you have an existing website, most likely you already rank for certain keywords, and we will be able to provide you with a detailed report. If you have a brand new website, you have to earn your stripes, and we will help you every step of the way to rank high in search engine results. Before we commit to optimizing your site, we will provide you with a detailed keywords report that includes search volumes and will let you know how hard it may be to rank to be included on page one in search results. If it's too hard, we will let you know ahead of time to better manage your expectations. ​If we get to the top of page one, is it forever? Since major search engines change their algorithms often and your competitors don't sleep either. Search engine optimization is an on-going process. We will monitor your rankings and will notify you when there is a room for improvement. Our existing customers receive weekly, monthly, or quarterly reports that are easy to read and understand. ​Do you or can you monitor competitors rankings? Will you create quality content for us? Most SEO plans include 2 articles / blogs per month, that's 24 high-quality articles annually. Topical articles help your website rank higher because you will be providing the information people are looking for, and we will make it easy to find. It will also make you an authority in your industry and your local markets. Ready to Get More Hot Leads? Optimize your website and let the calls, orders or walk-ins roll in!